On 8th March 2014, MH370 went missing. In the subsequent days, suddenly, almost everyone is a theorist, plane expert, SAR expert and a comedian. The internet has provided an open platform for the general public, including those without any thinking/rational capacity to express their thoughts and opinions, uninhibitedly. In Malay (Malaysia), “biawak” is a type of varanus, living mostly in the forest. There are many types of its species, but a common one when spoken about in Malaysia is the monitor lizard. The lexeme “biawak” can also be used as a verb, as in “membiawak”, which means to crawl, slither or slide (like a monitor lizard). Generally, the noun “biawak” carries negative connotation in Malay. This is due to the fact that a monitor lizard eats small animals, vermin, dead animals and decaying flesh (although some species do eat vegetation), and it scavenges human waste too. It is perceived as ugly and highly temperamental. All these characteristics contribute to an unpleasant reputation. Figurative language such as similes, metaphors, idioms, idiomatic expressions and proverbs is very culturally specific. How it is structured, rhymed and intended to mean depends very much on real-world experience and perception of its native speakers. In the case of “biawak”, its status and how it is perceived are clearly depicted in how it is used in our figurative language. Seperti biawak, masakan hilang kesatnya A monitor lizard does not lose its roughness (of skin) A person of no manners speaks harshly. Bila pula biawak duduk? When does a monitor lizard sit? A question with an impossible answer; asking for the impossible. As we can see above, figurative expressions associated with “biawak” in Malay all carry negative connotation and meaning; even its body parts, such as the tail and tongue. All the negative connotation is mostly due to the bad press these types of lizards is getting - perhaps the killing of livestock and/or destruction of farms. In an agricultural society, that simply means loss of means of income, and any animal which causes harm to livelihood is declared war upon. In short, to be called a "biawak" is never a good thing in Malay.While it is an important animal in the eco-system, it is obviously under-appreciated and resented by the society. 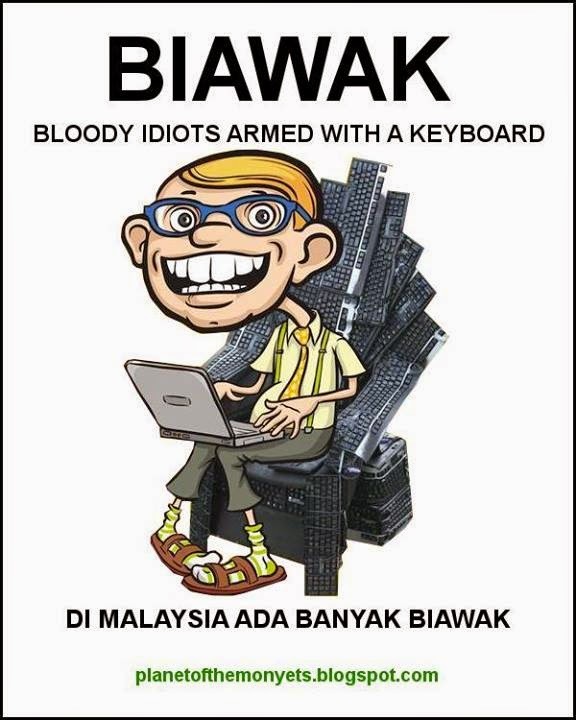 Reaction is generally hostile towards "biawak" (unless of course, you eat it, but that's a different story altogether). http://prpm.dbp.gov.my/. Retrieved on 1st April 2014.
http://www.peribahasaindonesia.com/. Retrieved on 1st April 2014.
http://www.himpunanperibahasa.com/. Retrieved on 1st April 2014.